Heading to Toronto, Canada to celebrate a milestone, and thinking about physical age vs. maturity. View Toronto August 2008 on GregW's travel map. I am back in Toronto for the weekend. It's a long way to fly for just a few days, I know, but I had to come back for a big event. My father is turning 80 this week, and we had a big party for him this past weekend. (Happy birthday, Dad!). It was an excellent event, lots of friends and family stopping by. Many people made the same comments to me. "I can't believe he's 80. He certainly doesn't look it." "No," I would reply, "he's still going full strength." I got to see a bunch of people I hadn't seen in a long time, and got to visit with all my family for the first time in a couple of months. Being away for a little while made me realize how tall and grown up all my nieces and nephews had gotten. One of my nephews towers over me, and another one is just an inch shorter than me at this point. By the next time I see him, he'll probably be looking down at his uncle. I remember each of their births, it doesn't really seem that long ago, but in reality 10 to 20 years have passed since those days. Later in the evening, after a lovely supper, I was standing with my Aunt. 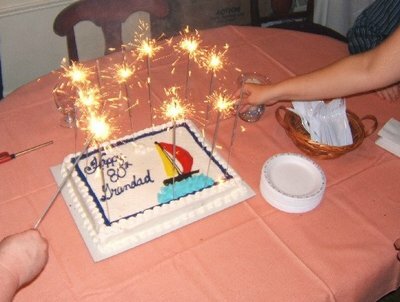 We worriedly watched smoke waft along the ceiling and over the smoke detectors of my father's condo's party room as sparklers on a large cake crackled away. Once the sparklers extinguished without triggering an alarm, my Aunt and I started discussing age. "It's hard to believe your Dad is 80," she said. "I know," I replied, and then not sure what to say next resorted to a tried and true cliche. "Time sure does fly." "It does," my Aunt replied. "Then again, it's hard for me to imagine that I am the age I am. I don't feel that old," she said. I knew exactly what she meant. My birthday is only a few months off at this point, and I am closer to 40 than I am to 30. Actually, to be truthful, I am closer to 40 than I am to 35. When I was a teenager, 30 seemed so mature, so adult. That was the age of people with good jobs and families, living in nice houses in the suburbs and driving Land Rovers. It certainly wasn't the age of unemployed, single guys who pick up and move to another country on little more than a whim. People who were 30 were stable, reliable, past their younger days of immaturity and spontineity. If you asked the 16 year old me what I would be like at 30, I can guarantee that the younger I would have answered something about a good job, a nice house and a Land Rover. 30 came and went, and pretty soon 40 will be upon me. No house, no job, no car, no family and probably little chance of any of those things in the future, save (HOPEFULLY, FINGERS CROSSED) the job. And while the 16 year old me probably never would have believed it, I'm pretty happy about it. Frankly, after visiting with more friends over the weekend, none of my friends really seem that old to me, even the ones with families and jobs and nice cars and houses. I don't think that people nowadays are less mature than previous generations, though maybe that is the case. More likely though, I think that young people always view old people as being mature, boring, responsible and dull. When really, people are who they are, no matter what age they are. So 40 is creeping up on me, and I'm not too upset about it. I looked at my 80 year old father, who is still enjoying life and love, spending nights out and getting in a fair bit of travel. Hopefully he will still be with us for many more years. And hopefully, by the grace of God or Allah or good genes or a steadily improving diet and a little exercise, I'll still be going strong by 80, which means I still have more than 40 years of life ahead me (hopefully much more). And if the next 40 years can be as cool as the last 10 have been, that seems like a really good deal to me, Even if I never do get my house, my family, my excellent job and my Land Rover. When I was a kid (thanks to Disney princesses), I thought that girls all got married when they were sixteen. That's when we found the one and were swept off. I'm quite past that deadline now and quite happily unmarried.